Susanne Wimberly with the source of her Wheyward Cheese Co. creations. Snoop moans when she eats. “Like it’s the best meal she’s ever eaten,” says Susanne Wimberley, who spends two hours daily milking Snoop, the long-eared, doe-eyed goat, that, along with her 21 bleating companions, supplies the raw product for Wimberley’s Wheyward Goat Cheese Farm. Wimberley is charming the audience at Di Luna’s farm-to-table dinner series in Sandpoint with stories about her beloved goats (mostly Lamanchas from Spain, and a few Nubians like Snoop) while diners munch on spinach salad topped with Wheyward goat cheese. Wimberley talks about working at an organic educational farm and falling in love with goats and how she apprenticed at a 120-goat farm in Oregon, learned cheesemaking from Quillisascut Cheese Company in Washington, and spends two hours each day making raw milk feta and tangy chevre on Wheyward’s 20-acre Hoodoo Valley Farm. After Wimberley, Ron Kilgore strolls to the low, curtained stage, evidence of Di Luna’s double-duty as both a popular Sandpoint restaurant and dinner concert venue. Tonight, however, it feels like an art opening where we’ve got the inside track. And it’s as much about the food as it is the North Idaho growers and producers featured on the menu. The spinach for the salads, for example, was provided by Muskrat Hill Farm, operated by Ron Kilgore and wife Chris. “We never intended to grow spinach,” says Ron. What the Kilgores found, however, was that their soil is particularly suited to growing greens, especially spinach. They use a combination of 600 square feet inside a year-round greenhouse and seasonal “hoop houses,” feeding their rotating crops — spinach, salad turnips, arugula, lettuce — with composted horse manure generously donated by neighbors. The spinach we’ve eaten had just been picked in February. With his salt-and-pepper, chest-length beard, ponytail and glasses, Kilgore looks every bit the laid-back professor, and he doesn’t miss out on schooling attendees. “[Farming] is worth it to us because we enjoy it, and we can afford it,” he says. The Kilgores are retired, but for many growers, says Kilgore, farming is cost-prohibitive. Kilgore cites a 2010 study by Anne Weill, an agronomist with Club Bio-Action in Quebec, that found that vegetable growers earn $18 per hour in gross sales. The study also states that while working 2,000 hours per year (equivalent to 40 hours per week, 50 weeks per year), the average farm owner could expect to produce $36,000 in gross revenue. 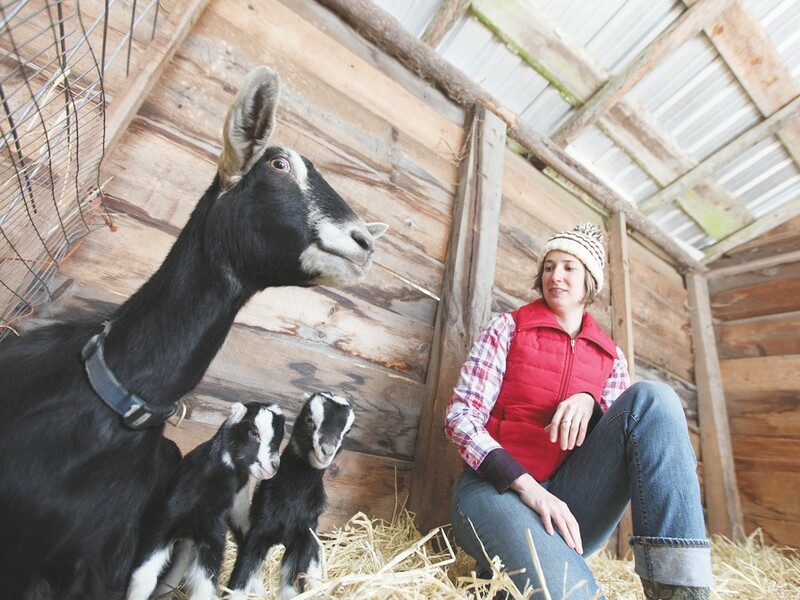 Mimi Feuling, who runs Cascade Creek Farm with her husband Rob Fredericks and their two children, shares his concerns. “We believe in nurturing our land as well as our animals,” says Feuling. Feuling’s Angus Cross beef cattle, poultry and “pleased piggies on pasture,” as they describe them, roam freely across Cascade’s 97 acres in Bonners Ferry. Cascade partners with nearby farmers to grow organic, pesticide-free grain — healthier for the animals and the local economy. Their meat is butchered, cured and frozen without pesticides or additives. For the dinner, Cascade supplied meat for pork loin and beef bourguignon, both of which were accompanied by vegetables grown throughout the Inland Northwest, including cherries from Paradise Farms (Bonners Ferry) and potatoes from 7 Gem (Deer Park, Wash.). Other veggies were supplied by Di Luna’s, in a roundabout way. Di Luna’s owner Karen Forsythe also co-owns Legacy Farms. Their 60-plus acres includes 10 acres for hay, an acre for berries, and another half-acre for fruit and vegetables, including beans, carrots, garlic, tomatoes, greens, apples, pears and plums. And when Forsythe isn’t farming or cooking, she’s managing Six Rivers Market, a co-op of three dozen members within 150 miles of Sandpoint. The idea for the farm-to-table dinner, says Forsythe, grew out of a 2009 “harvest” dinner. Initially she planned on doing one such dinner every year, but after seeing all the local products available, Forsythe says the farm-to-table dinners are now being planned for every six weeks. Although Cascade doesn’t typically supply to restaurants, Forsythe featured them, saying she was impressed with Feuling’s commitment to the community. “I have a huge passion for educating people,” says Feuling, who advocates for change in both the consumer’s mindset and food industry practices. “I know from personal experience, as well as people telling me, that going organic really doesn’t cost as much as they thought, especially when they start adding up all the money they save from less medical expenses. Food that feeds the body in a healthy way keeps the doctor visits to a minimum,” says Feuling. As far as Cascade goes, says Feuling, their belief is that if you’re going to eat meat, then you want to start with happy, well-tended animals from a farmer you trust. “My mantra is ‘Know your farmer,” says Feuling.